Leukemia is a hematopoietic cancer that originates in the bone marrow. It is a heterogeneous disease involving a large number of genetic abnormalities at the chromosome and gene levels. These genetic lesions function as oncogenes or mutations in tumor suppressor genes and thus play a direct role in leukemogenesis. Genetic abnormalities have implications for the differential diagnosis and prognosis of leukemia and for selecting the appropriate therapy, monitoring treatment, and managing drug resistance, which makes molecular hematology a very novel emerging and valuable specialty in pathology and oncology clinics. Discovery of the Philadelphia (Ph) chromosome in chronic myeloid leukemia, its corresponding BCR-ABL fusion oncogene, and its use as a diagnostic marker was made possible due to the development of molecular and cellular genetic techniques such as karyotyping, fluorescent in situ hybridization (FISH), the polymerase chain reaction (PCR), and DNA sequencing. In the recent past, the development of the first molecular targeted anti-cancer drug imatinib was a result of genetic techniques and their application in the field of hematology. Presently, high-throughput molecular genetics techniques such as microarray and next-generation sequencing are being employed to understand the mechanisms underlying leukemia initiation, progression, drug resistance, and relapse. This is likely to assist in discovering new biomarkers for early diagnosis, molecular prognostication, and sensitive monitoring of response to anti-leukemic therapies. Molecular insights into leukemogenesis will also help to discover novel drug targets for developing molecular targeted therapies aimed at specific fusion oncogenes and mutations associated with leukemia that are more effective. Therefore, advances in molecular hematology are likely to help better diagnose, treat, and possibly cure the deadly disease leukemia in the near future. To assess the safety of early discharge of patients after receiving high dose Ara-C (HiDAC) consolidation for acute leukemia. 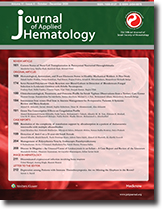 Sixty five leukemic patients who had achieved complete remission and received 96 cycles of HiDAC between 2005 and 2010 were divided into 3 groups and their outcomes compared in terms of length of hospitalization and incidence and type of infections. Group I (12 patients) received HiDAC (total of 17 cycles) and stayed in the hospital after HIDAC until absolute neutrophil count (ANC) recovery, group II (23 patients) received HiDAC (total of 35 cycles) then were immediately discharged without antimicrobial or granulocyte colony stimulating factor (G-CSF) prophylaxis and group III (30 patients) received HiDAC (total of 44 cycles) then were immediately discharged but were prescribed antimicrobial and granulocyte colony stimulating factor (G-CSF) prophylaxis. Total number of hospitalization days and types of infection were recorded for all patients. Patients in group II required re-admission for febrile neutropenia (FN) during 33 cycles (94.3%) and for severe thrombocytopenia during 2 cycles (5.7%) with a median duration of inpatient hospitalization of 15 days. One patient in this group developed septic shock and required 4 days of ICU admission. Patients in group III did not develop FN during 21 cycles (47.7%) and had FN in 23 cycles (52.2 %) which required re-admission for a median of 8 days. Patients in group I had FN in 11 cycles (64.7%) while in the hospital. The differences in inpatient hospital length of stay & FN incidence were statistically significant among the 3 groups (p<0.001 and p=0.005 respectively). Conclusion: Early discharge with antimicrobial and G-CSG prophylaxis after HiDAC for acute leukemia is safe and feasible and may potentially save valuable resources by shortening the duration of inpatient hospital stay. Social lifestyle plays a significant role in the transmission of human immunodeficiency virus (HIV). Hence, abstinence and faithfulness are important for preventing HIV transmission. This study aimed to determine the prevalence of HIV antibodies among Muslims in Osun state, Nigeria. A total of 1554 Muslims who attended mosques for worship and provided consent were recruited for this study. Relevant data were obtained using a pro forma designed for this purpose. Blood specimens were collected for HIV screening using Determine, Unigold, and Stat Pak HIV kits according to an approved serial algorithm. Out of 1554 subjects, who opted for HIV counseling and testing, 434 (36.29%) belonged to the highly productive age group and were aged 28-37years. Among the subjects, 689 (44.34%) were unmarried individuals; however, 13 (0.84%) were divorcees and 25 (1.61%) were widows/widowers. Among the married participants, 207 (25.03%) belonged to polygamous families, whereas, 620 (74.97%) were from monogamous families. There were 200 (12.87%), 52 (3.35%), 70 (4.5%), and 128 (8.24%) unemployed individuals, uniformed men, drivers, and students, respectively. Seroprevalence of HIV was found to be very low (0.064%). However, seroprevalence of other subgroups was 0.0%. Among the subjects, illiterate, unemployed, married women from monogamous families, who were aged 28-37 years, were found to have HIV antibodies. The study reveals that there is a very low prevalence of HIV among faithful Muslims in Osun state, Nigeria. There is a need for intensive health education through religious groups that emphasize moral fidelity among married and unmarried individuals. This study retrospectively analyzed 56 consecutive pediatric patients diagnosed with acute myeloid leukemia and treated with chemotherapy alone, according to the modified Medical Research Council10 protocol, in our institution between 1996 and 2012. Patients were stratified according to the cytogenetics and remission status into low-risk, intermediate-risk, high-risk, and unknown-risk groups. There were statistically significant differences in the overall survival (OS) rates between the risk groups (P < 0.0001). The 5-year OS rates were 85% ± 10% for the low-risk group, 65% ± 13% for the intermediate-risk group, and 31% ± 10% for the unknown-risk group. None of the patients in the high-risk group survived for 5-years. The 5-year event-free survival rates were 70% ± 13%, 59% ± 14%, and 31% ± 12% for the low-, intermediate-, and unknown-risk groups, respectively. The differences among these groups were statistically significant (P < 0.0001). These findings are comparable with those reported by studies in Europe and North America, but they differ from those reported in Asia. We conclude that risk-based stratification predicts the outcome of pediatric patients treated with chemotherapy alone and that the survival rates are similar to those in other published studies. Newborn screening (NBS) programs help identify serious disease conditions that can lead to mortality, morbidity, and disability and can be controlled only after detection. The purpose of NBS is identifying infants with clinically significant disorders, providing them with specialized care, and educating parents at an early stage before the onset of clinical symptoms. The efficiency and effectiveness of NBS depends on the smooth integration of sample collection, laboratory testing, follow-up, diagnosis, timely treatment, management, and tracking of outcomes. NBS began in the early 1960s with the original work of Dr. Robert Guthrie, who developed a screening test for phenylketonuria and a system for the collection and transportation of blood samples on filter paper. NBS has been nationally recognized as an essential program that aims to ensure the best outcomes for the nation's newborn population. However, there are no defined national standards for NBS[1-6].. In 2000, the Newborn Task Force of the American Academy of Pediatrics (AAP) indicated that uniformity among programs would benefit families, professionals, and public health agencies. Neonatal screening programs are effective when they are integrated into comprehensive follow-up services and coupled with parental education and support. Hemoglobin disorders and glucose-6-phosphate dehydrogenase (G6PD) deficiency are the common disorders that affect newborns in the Kingdom of Saudi Arabia, and the incidence of these diseases has shown wide geographical variation[ 8-12]. NBS for sickle cell disorders (SCDs) and G6PD deficiency was introduced in the Kingdom of Saudi Arabia in the early 1980s[13-14]. The primary objective of neonatal screening is to identify infants with clinically significant disorders such as SCD, thalassemia major, and G6PD deficiency and provide comprehensive care and follow-up with early parental education to reduce morbidity and mortality[15-19]. Thrombotic thrombocytopenic purpura (TTP) can result from a deficiency of von Willebrand factor-cleaving protease (vWF-cp) activity. Patients infected with human immunodeficiency virus (HIV) can present with acquired vWF-cp deficiency. We report a case of an HIV-infected woman who presented with relapsing thrombotic thrombocytopenic purpura (TTP) and was found to have an acquired ADAMTS 13 inhibitor. She was treated with plasma exchange and highly active antiretroviral therapy, which led to fewer clinical relapses. Autoimmune hemolytic anemia (AIHA), an immune disorder caused by antibodies directed against unmodified autologous red cells, is generally recognized as a paraneoplastic phenomenon in lymphoproliferative disorders. While a number of case reports have described an association between AIHA and solid tumors in almost all types of cancers, this case report describes the first reported observation, treatment, and prognosis of a patient who presented with AIHA and gastrointestinal stromal tumor (GIST), an uncommon soft tissue tumor that arises from interstitial cells of Cajal.